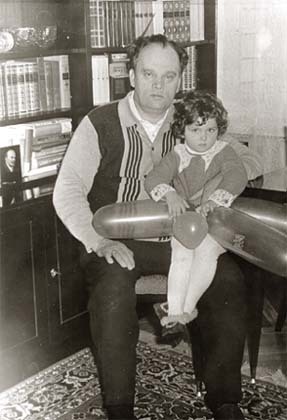 "...The Kyiv period of activity of Ivan V.Kudryavtsev (1958-1975) was the most fruitful and bright in his life. In Kyiv, he managed to found the powerful Scientific and Research Institute of Radio-Electronics (KNIIRE), where a number of significant radio-electronic computer systems for military surface- and underwater Navy of the Soviet Union was developed, designed and manufactured On his initiative, for the first time in the USSR, the Institute started to build computer on-board radio-electronic complexes, on microelectronic basis, as well as a specialized on-board computer, firstly in Ukraine and in the Soviet Union. The complexes included both hardware and software, necessary to solve the following navy tasks: to gather data on surroundings, to control weapon, incl. missiles, to navigate, etc. These computer complexes were built in Kyiv and supplied ready-made to the Navy forces. Unique test benches simulating the ship atmosphere were created at the institute's production halls. Later, such approach, conditioned by the introduction of new computer techniques would be named "a system approach". Kudryavtsev's intuition when solving complicated technical tasks was amazing: he managed to put the most fantastic ideas into practice. In his private life, he was a very modest person. Only his close relatives knew about his valuable decoration - the Order of the Red Star. A lot of his Institute's colleagues never guessed, that their director was without one leg. He cared about his colleagues and employees, understood quite well the abilities of every person and knew how to use the potential of the enormous institute's team under his guidance. Ivan Kudryavtsev died in 1975. At that time his works were kept secret and it made his name practically unknown even in Ukraine, where he worked, though at the West this person was known and arose great interest. "The great organizer of military industry died" announced BBC, British Information Service..."